This is the series that started it all, if by “it all” you mean “David’s writing career.” The first book in the series, CHILDREN OF AMARID, came out in May 1997 — it was the first piece of fiction David ever published. It was followed in October 1998 by THE OUTLANDERS. 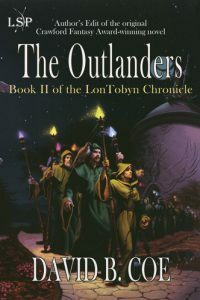 In 1999, International Association for the Fantastic in the Arts (IAFA) awarded David the William L. Crawford Fantasy Award, recognizing the LonTobyn Chronicle as the best work by a new writer in the field of fantasy. And now, after being out of print for more than a decade, the books are back, newly revised by the author, and soon to be available in ebook and trade paperback format. These are the Author’s Edits of the original books (think “Director’s Cut”). The original plot characters, world building, and magic system remain, but the prose has been updated and polished to reflect David’s craft as it stands now, after 20 years in the business. For fans of the original series, and those coming to the books for the first time, this is an opportunity to read an award-winning series as re-imagined by a seasoned veteran of the fantasy genre. Enjoy these books, and share them with your friends. 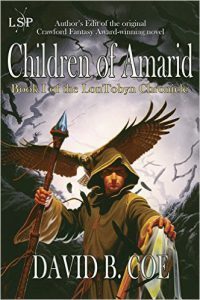 For a thousand years, the Children of Amarid, mages and masters whose power flows from psychic connections they form with birds of prey, have guarded the idyllic land of Tobyn-Ser, a realm of lofty mountains, rolling plains, and deep, verdant forests. Their magic has brought peace, prosperity, and the complacency that a millennium of pastoral comfort might breed. Now, however, it seems that the mages have abandoned their oaths to serve Tobyn-Ser, bringing fear and chaos to the land and shaking the peoples’ faith in the mages and their Order. Have renegades infiltrated the Order? Has the spirit of Theron, a dark mage who cast a curse on the Children of Amarid in its earliest days, returned to haunt the land? Or does Tobyn-Ser face an even greater threat from its sister land of Lon-Ser, a realm of vast, violent cities and technological wonders beyond imagination. 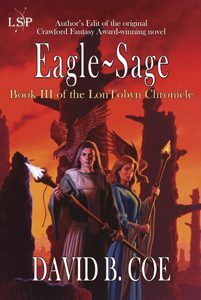 The LonTobyn Chronicle, the debut epic fantasy trilogy by David B. Coe, consists of CHILDREN OF AMARID, THE OUTLANDERS, and EAGLE-SAGE. You can purchase the entire series in ebook or paperback formats. Navigate to the book pages for purchase links. And thank you!